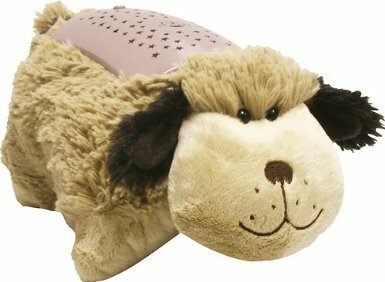 Dream Lites Pillow Pets Snuggly Puppy (Golden Blonde) - As Seen On TV The Night-Lite That Turns Your Room Into A Starry Sky! Runs on 3 AAA Batteries or Ac Adapter (Not Included) Pillow Pets Dream Lites for Ages 3 and Up. Sleep Timer Option The Night-Light That Turns Your Room Into a Starry Sky! Comforting Pillow Pets. WARNING: CHOKING HAZARD- Small parts,not for children under 3 years of age. Helps Alleviates Worry from the Dark. Projects a starry sky on your ceiling and walls! Sleeptime, Playtime, Anytime!